A couple summers ago, I started a pop punk band. We spent three painfully hot months practicing in a house with walls covered in New Found Glory flags and gig posters, writing generic songs that probably ripped off The Wonder Years even more than we realized at the time. After about six shows, we faded out and went on to other endeavors, but that band and that time will always hold a special place in my heart. 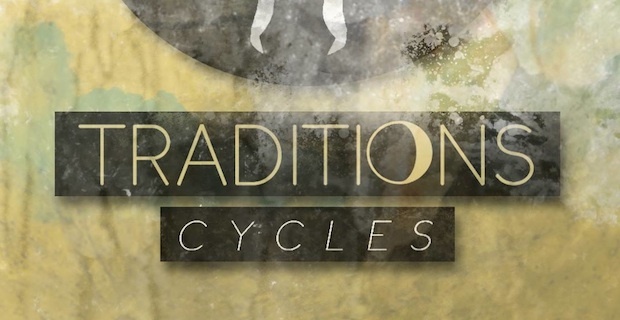 I bring this up because every time I spin Cycles, the latest EP by Westfield, Massachusetts group Traditions, I get flashbacks to basement shows, gang vocals, and the carefree love of pop punk shared by five Midwestern kids in the summer of 2012. “Ten Days” kicks off Cycles with an undeniable burst of energy. The quartet pack everything they do best, from frontman Randy Burlingame’s soaring vocals to a tight, speedy drum beat and chunky guitar riffs, into the first fifteen seconds of the track. Their confidence and comfort with their genre are obvious in those opening notes, and they remain so for the rest of the EP. It’s just as easy to sing along with the catchy chorus of “Ten Days” as it is to imagine stagediving to “Progression Regression” or crowding around a microphone with your arms around your friends’ shoulders to yell the half-time ending of “Eyes of a Man.” Moments like those never fail to spark up the nostalgia I mentioned before. The biggest problem with Cycles is that there isn’t a lot to differentiate it from dozens of other releases in this genre. Burlingame’s lyrics rarely stray from the well-traveled territory of breakups, friendships, and feeling directionless in your early twenties. Musically, Traditions suffer from essentially the same problem. They do their chosen sound well enough, but the five songs on Cycles offer little in the way of variation or willingness to branch out. Save for the drawn out ending of “Polarity,” there’s not much breathing room on the EP. A slower song, a heavier song, or even toying with song structures would make for a more rewarding record, especially on repeat listens. The upshot of this is that Traditions are still a very young band. This is only their second release, following a four-way split from late last year, so the fact that they’re already as tight and together as they sound here says a lot about their potential. While they aren’t going to turn the genre on its head with Cycles or immediately become your favorite band, I would bet that somewhere down the line, they have at least one great record in them, so you might as well hop on board now.